Last night we went to a wedding, and in a very-like-me fashion I completely forgot about a gift until the day of the wedding (lucky it didn't start till the evening!). So I stamped a mini version of the personalised letter art. I also made a stamped "love" card. Simple, but pretty. I did my usual thing of wrapping in brown paper and accessorising. Is it weird that my mother in law asked if I wanted a bunch of fake flowers, and my thoughts were that I could pull the heads off? Now I have a huge bunch of them that I keep having to move off the table so we can eat. They do look pretty on a present though. I just used a couple of strips of double sided tape to attach it. So what do you think about the smaller art version? Here's the big and small side by side. I think the smaller one is a nice alternative to more stamps, plus I wouldn't have to charge as much because it doesn't take as long to make. Any of you ever pull the heads of fake flowers to decorate? Just me? I just can't seem to look at objects the same any more! I always think "How could I make something with that?" and BAM, now I'm a hoarder! I have an anniversary on tuesday 28th feb,i have been divorced 4 years on tuesday,Luke say's we should have a party!!!!! I too am constantly forgetting to get gifts ready in time! 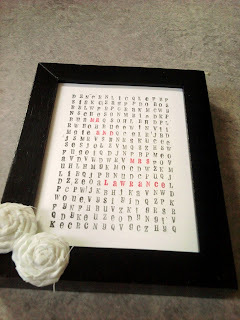 I love that you came up with the perfect gift in such a short amount of time...I'm sure the bride never knew ;) ...and I just adore the card...I love the size and length and the simplicity is charming!